"Interpretation is a communication process, designed to reveal meanings and relationships of our cultural and natural heritage, through involvement with objects, artifacts, landscapes and sites." It should be stressed that interpretive communications is not simply presenting information, but a specific communication strategy that is used to translate that information for people, from the technical language of the expert, to the everyday language of the visitor. Where do the basic strategies, techniques and principles of Interpretive Communications come from? In reality, we see the use of interpretive techniques and principles every time we see an advertisement in a magazine or on television. One of the key areas of knowledge that heritage interpreters must have to be effective in their presentations is an understanding of how visitors learn and remember information in a recreational learning settings. A recreational learning experience is one where the person has self-selected to attend or participate in a program for "fun". The "learning" that occurs is viewed as fun as well. Anyone that has a hobby, such as coin collecting, model making, studying aspects of history, bird watching, etc. is involved with recreational learning. We learn because we want to, and the process of learning and discovery gives us pleasure. Information, Environmental Education and Interpretation - what's the difference? We are often asked what, if any, are the differences between the three; information, environmental education, and interpretation. Information presented to visitors is just that, straight facts, figures and dates. A field guide to birds provides "information" about the bird species, but usually no interpretation. However, all interpretation contains information. Interpretation is not what you say to visitors, but rather the way you say it to them. 4) possibly USE the information in some way. We see many formal environmental education programs where very little "education" occurred. Participants were presented information, remembered parts of the information, but probably really didn't understand the answers that they were giving back to their teachers. We have also seen teachers in formal classroom environmental education programs use "interpretive" techniques that left their students inspired, motivated, and excited about learning more. Interpretation is not topic or resource specific. The interpretive communication process can be used for interpreting anything, any subject. If the interpretive communication is effective, then "education" can occur about that subject. Interpretation is an objective driven, and market (audience) focused process that looks for results (the accomplishment of stated objectives). It uses marketing and advertising techniques, journalism strategies, and a host of other material integrate communication strategies to form our Interpretive Communications Strategy. Interpretation is also a fun recreational learning experience. What is the Interpretive Communication Process? The communication process used to "interpret" information is based on Tilden's Interpretive Principles (Tilden, 1954). Tilden's basic communication principles are also the ones you will find in every first year marketing or advertising text book on successful communication with your market (audience). First, the communication must 'provoke' curiosity, attention and interest in the audience. If you can't get their attention, they won't even stop at an exhibit, want to attend a program, or pay attention during programs. In planning the strategy as to how to provoke attention, the interpreter has to consider the answer to the question: Why would a visitor want to know this information? The answer to that questions ends up being the graphic, photo, or statement that gets the audiences attention. Next, the interpretation communication must find a way to 'relate' the message to the every day life of the visitors. In advertising, it's the answer to the question 'why do youneed this product or service?' This part of the communication gives people reasons to continue with the exhibits, programs, or media gives them a reason to pay attention and want to learn/learn more. The final part of the process is 'revelation'. Tilden says that we should reveal the ending or answer of the communication through a unique or unusual perspective of viewpoint. Save the answer to last. The reveal tells the visitor why the message was important for them, or how they can benefit from the information that was interpreted to them. 'Strive for message unity' is another principle for interpretation. It means that when we plan or design our program, service, or media,that we use the right colors, costumes, music, designs, etc. to support the presentation of the message. Think of message unity as the stage setting and props for a theatrical presentation. And finally we need to 'address the whole'. This final principle means that all interpretation shouldaddress some main point or theme "the big picture" of what is important about the park, historic site, tourism site, etc. that the visitor is at. The main theme is best illustrated by your answer to the question "if a visitor spends time going to programs, looking at exhibits, etc. while they are visiting my site, by the time they are ready to go back home if they only remember or learned onething about why our site is so special, that one thing better be __________________________! The answer to this question is 'the whole'. An example of such a theme might be "We are using state of the art land restoration techniques to improve this site for people and for wildlife." 1. Why would the visitor want to know that? If you can's answer this question, you are going to have trouble "marketing" the progam or service. We don't want to be in the business of giving answers to questions no one is asking. 2. How do you want the visitor to use the information you are interpreting to them? If you don't want visitors to use the information you are interpreting, then why are giving it to them? There are not any "right or wrong" answers to these questions. It does help the interpreter focus on interpretive something relevant to the visitors. There is a basic model of the total communication process (Figure 1 below). 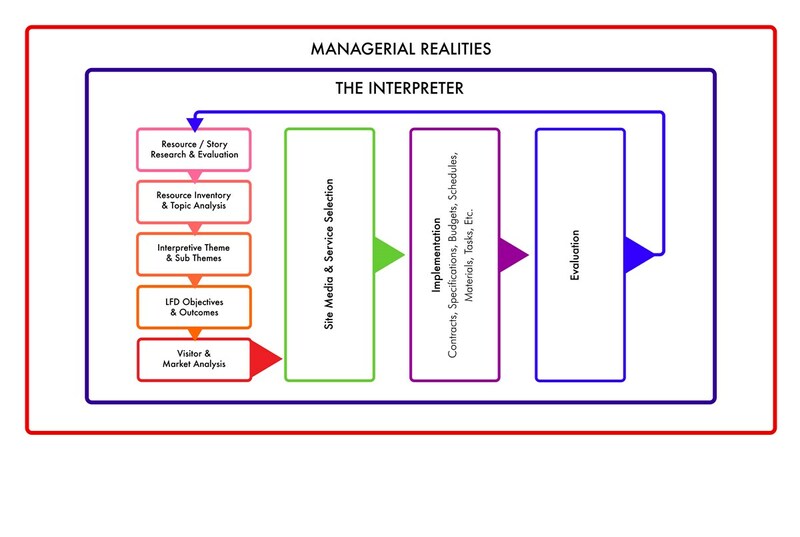 In this model of interpretive communications we can see several different components. First, we must have some message (WHAT) that we want to convey - the 'what' is the story that we want to tell. Then we must have specific objectives that we want the message, program or service to accomplish. We have interpretive techniques that we can use to actually present the message (Tilden's principles), and services in which to use the techniques (self-guiding trail or auto tour, live program, exhibits, publications, etc.). We are communicating our message to visitors, so we need to know as much as possible about them (visitor analysis). We will only know if our message as received and understood by the visitor if we evaluate the program or service to see if our original objectives were accomplished. If not, we need to go back to make some adjustments. Note the I&O box. This is for Implementation and Operations considerations, such as costs, staffing needs, material needs, etc. to actually plan, design, build, etc. the interpretive programs or services (such as exhibits). perspective to any project or program. We have our unique personality, background, and presentation style. So each program or service will have the individual fingerprint of the interpreter who planner or presented it. And more...... what are yours? This brief paper has focused on the basic presentation of what is interpretation. Interpretive Communication principles have evolved from a variety of other communication professions. The basic principles of what makes a presentation interpretive vs information is not so much on what you say, but rather how you say it. For the communication to be interpretive, it must Provoke, Relate, Reveal, Have Message Unity, and Address the Whole. The model of interpretation shows how the total communication process works, and becomes the basis for developing a philosophy and strategy for Interpretive Planning. - Visitors. Eastern Acorn Press. - Tilden, Freeman. 1957. Interpreting Our Heritage, The University of North Carolina Press, Chapel Hill. - Veverka, John A. 1994. Interpretive Master Planning. Falcon Press, Helena, MT.